Excel provides numerous predefined table styles that you can use to quickly format a table. If the predefined table styles don't meet your needs, you can create and apply a custom table style. Although you can delete only custom table styles, you can remove any predefined table style so that it is no longer applied to a table. 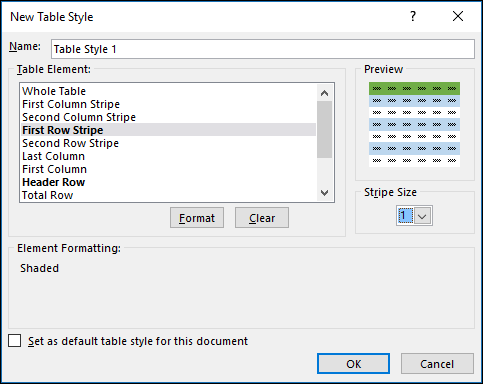 You can further adjust the table formatting by choosing Quick Styles options for table elements, such as Header and Total Rows, First and Last Columns, Banded Rows and Columns, as well as Auto Filtering. When you have a data range that is not formatted as a table, Excel will automatically convert it to a table when you select a table style. You can also change the format for an existing table by selecting a different format. Select any cell within the table, or range of cells you want to format as a table. On the Home tab, click Format as Table. Click the table style that you want to use. Auto Preview - Excel will automatically format your data range or table with a preview of any style you select, but will only apply that style if you press Enter or click with the mouse to confirm it. You can scroll through the table formats with the mouse or your keyboard's arrow keys. When you use Format as Table, Excel automatically converts your data range to a table. If you don't want to work with your data in a table, you can convert the table back to a regular range while keeping the table style formatting that you applied. For more information, see Convert an Excel table to a range of data. Once created, custom table styles are available from the Table Styles gallery under the Custom section. Custom table styles are only stored in the current workbook, and are not available in other workbooks. Select any cell in the table you want to use to create a custom style. On the Home tab, click Format as Table, or expand the Table Styles gallery from the Table Tools > Design tab (the Table tab on a Mac). Click New Table Style, which will launch the New Table Style dialog. In the Name box, type a name for the new table style. To format an element, click the element, then click Format, and then select the formatting options you want from the Font, Border or Fill tabs. To remove existing formatting from an element, click the element, and then click Clear. Under Preview, you can see how the formatting changes that you made affect the table. To use the new table style as the default table style in the current workbook, select the Set as default table style for this document check box. Select any cell in the table from which you want to delete the custom table style. Under Custom, right-click the table style that you want to delete, and then click Delete on the shortcut menu. Note: All tables in the current workbook that are using that table style will be displayed in the default table format. Select any cell in the table from which you want to remove the current table style. The table will be displayed in the default table format. Note: Removing a table style does not remove the table. If you don't want to work with your data in a table, you can convert the table to a regular range. For more information, see Convert an Excel table to a range of data. Header Row - Apply or remove formatting from the first row in the table. Total Row - Quickly add SUBTOTAL functions like SUM, AVERAGE, COUNT, MIN/MAX to your table from a drop-down selection. SUBTOTAL functions allow you to include or ignore hidden rows in calculations. First Column - Apply or remove formatting from the first column in the table. Last Column - Apply or remove formatting from the last column in the table. Banded Rows - Display odd and even rows with alternating shading for ease of reading. 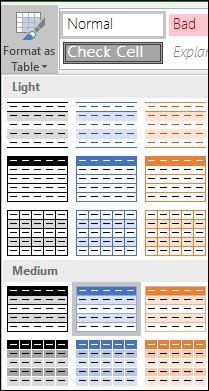 Banded Columns - Display odd and even columns with alternating shading for ease of reading. Filter Button - Toggle AutoFilter on and off.